The week began with a final influx of feedback from the faculty. Overall a couple of frame rate issues were identified and a couple of jerky bird movement issues were pointed out. Apart from these changes most of the team was now transitioning to the our preproduction concept which now had a title – The Melody of Life. Below is a log line for the experience that we want the next team to stay true to. Interactions – The experience will be a room scale VR experience without interactions. VR interactions are major design challenges and solving them is not the focus of the animation studio. Setting – The experience will be set in a child’s room. There will be three distinct areas in the room that look slightly out of place, but have distinctly cultural connotations. This is intended as a metaphor for each culture existing in it’s own part of the world. The viewer makes her way to a cultural zone in the room. As she walks towards them, a visual cue such as a glow on the area coupled with hints of cultural music draws her in. When the viewer reaches the zone, the dolls placed will rise up in the air and dance around the player to a distinctly cultural tune representing a celebration of life. This will repeat on three occasions as the player approaches each designated area drawing her into each culture piecemeal. Once all three dances have been triggered, a circular stage appears in the centre of the room drawing the player in. Once the player reaches the stage each of the cultural dolls come in to the center and begin dancing in unison. At first the music will remain distinct with each tune of cultural music represented separately. The player will trigger the music based on which doll he is gazing at. However, over time the music will start to blend into a single tune. As the music changes the dolls will begin to imbibe elements of the other culture’s dance into their own, until finally they are all dancing to the same tune and the same melody. This week signalled the final week of development. 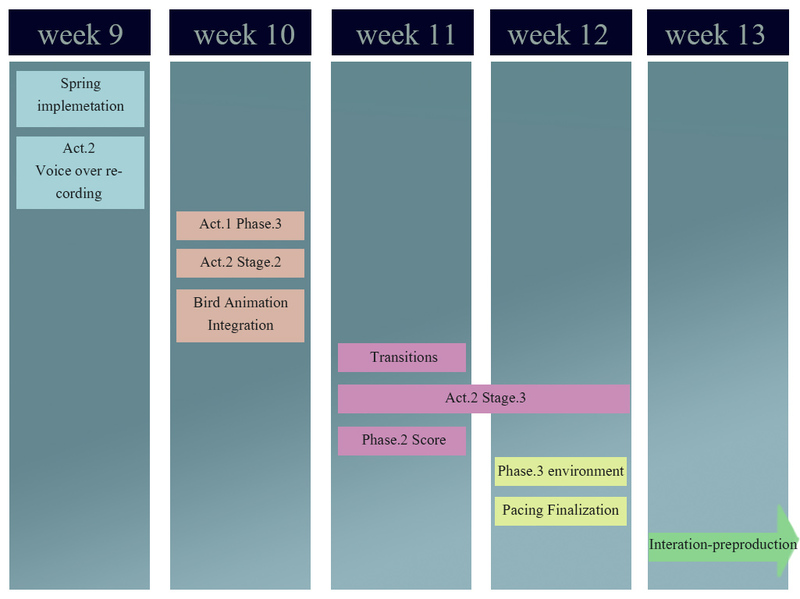 The CG part of the experience (Act 2) was being developed in a separate sandbox and now needed to be integrated. The integration included establishing of pacing and perspective shifts. 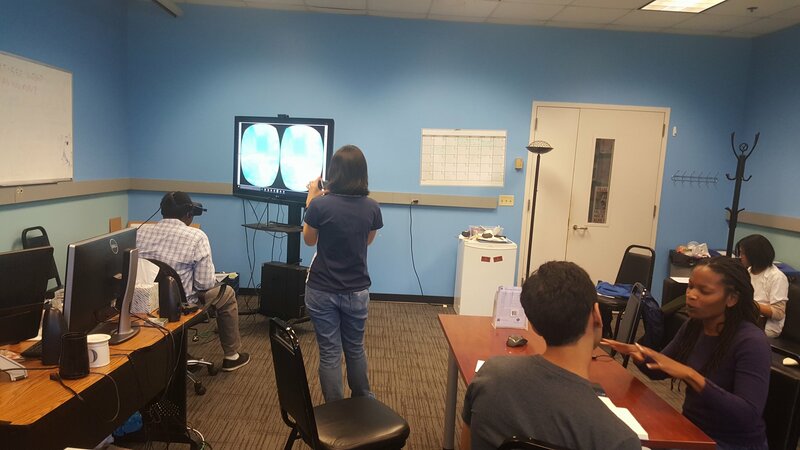 Considering the more intimate nature of this aspect of the experience, we wanted to make use of VR in the best possible manner. Therefore, we moved the camera in and out of the fluid moving elements in the sequence. Additionally, we ran into interesting spline movement issues that were highlighted at this juncture only because of the creation of smaller splines. Last week signalled the final pivot for the direction of the experience. With the puzzle complete, all that remained was the execution. The audio that the viewer hears inside the currents, and towards the end of the experience were now even more crucial aspects of the experience. We had fellow ETC students write down snippets of their favorite story lines. We recorded a few of the more memorable lines and mixed them together creating a babble like whisper effect. The visual elements were also now starting to come together with final touches on the springs and currents. This week we executed another set of playtests with a slightly younger age group. We found that players were now having emotional reactions to the imagery of the world and the music. Descriptions of the experience were typically along the lines of ‘peaceful’, ‘soothing’, ‘calm’ and ‘serene’. However, we found that players still were not honing in on any interpretation of the experience. We decided to strip away elements of the experience arc that were not adding any value. Instead we decided to really zone in on communicating visually and aurally one specific design challenge, i.e. 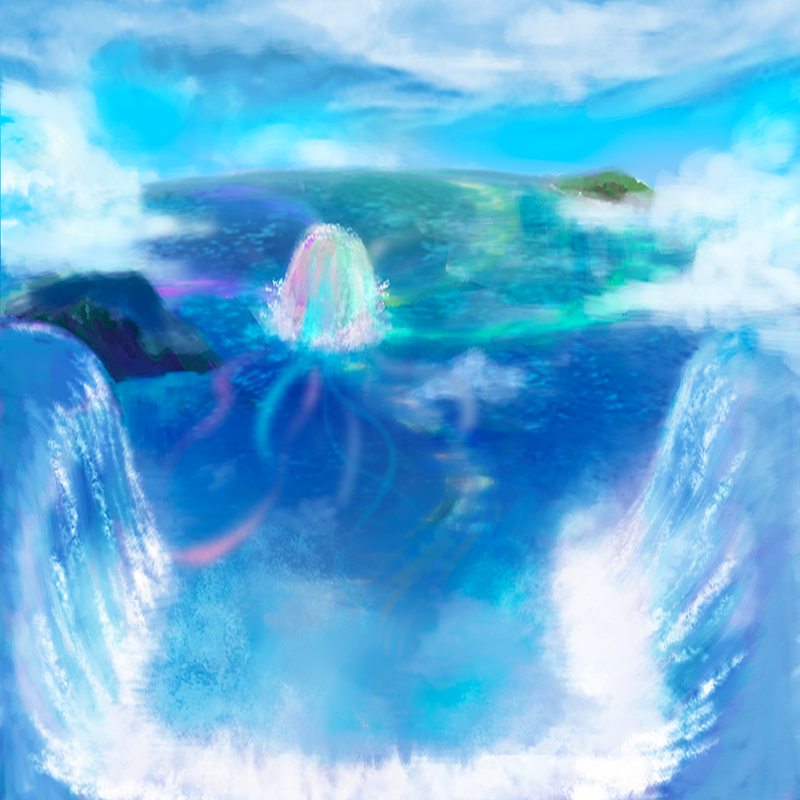 the sea and the currents as representations of stories. This week we thought we’d share some of the technical details of our implementation of Act 2 which is entirely computer generated imagery. 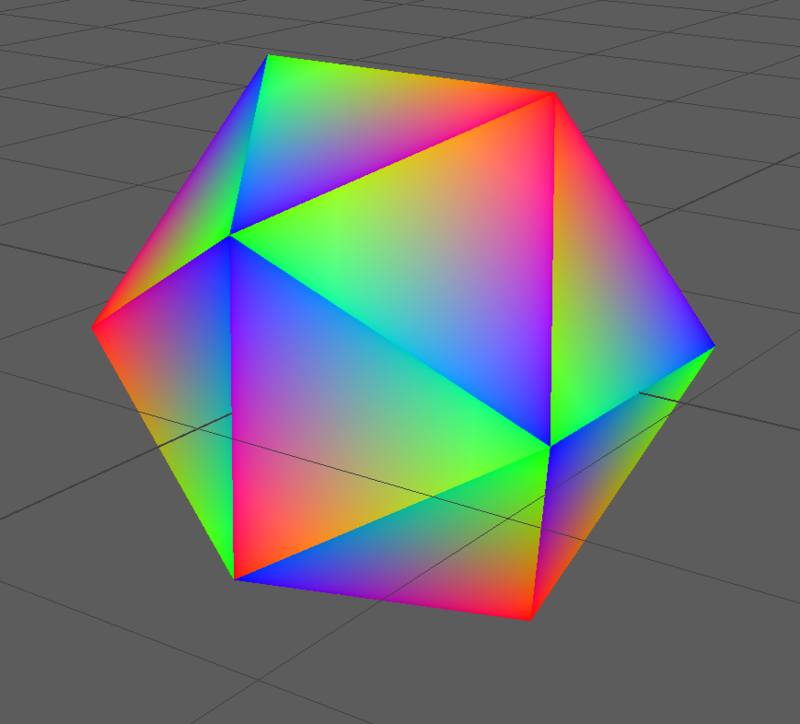 The geometry of the cage is no more than an icosahedron. The smooth line and the face fading in effect are implemented based on barycentric coordinate. We split the shared vertices to ensure each face/triangle has its own three vertices. For each triangle we assign a unique barycentric coordinate as vertex to three vertices. After rasterization the coordinates are interpolated among pixels which can finally be used to determine distance to triangle boundary, and used to shade edges. The shattering effect of cage is based on UE4 destructible mesh which creates the debris pattern based on voronoi diagram. The shape of orb is even simpler: it’s just a sphere. However, we added a bunch of details to it based on displacement mapping and normal mapping. Textures are procedurally generated from noises. In order to prevent the uv distortion of sphere, a technique named tri-planar texturing was employed. 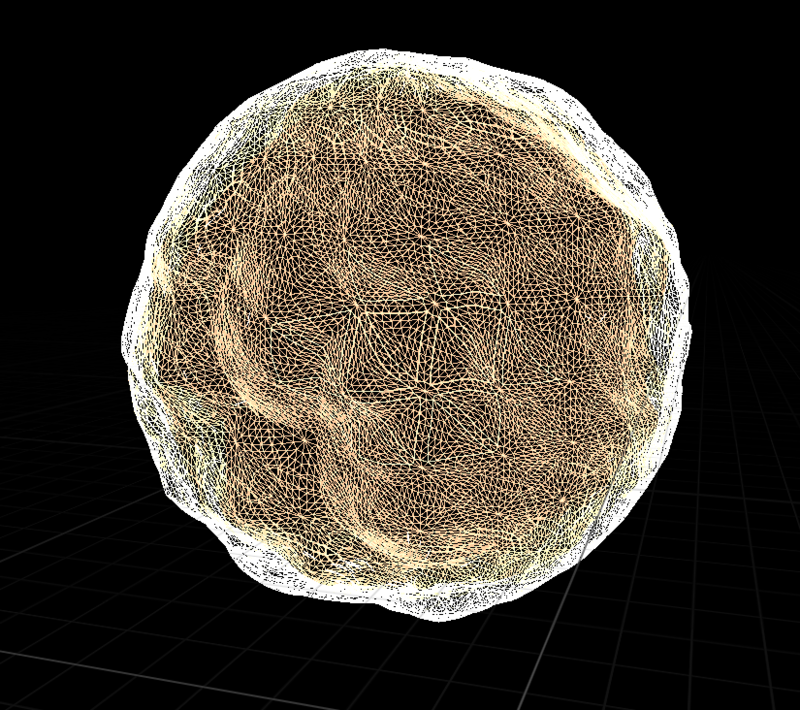 TPT is a blending of three sets of textures based on the normal direction of each pixel. 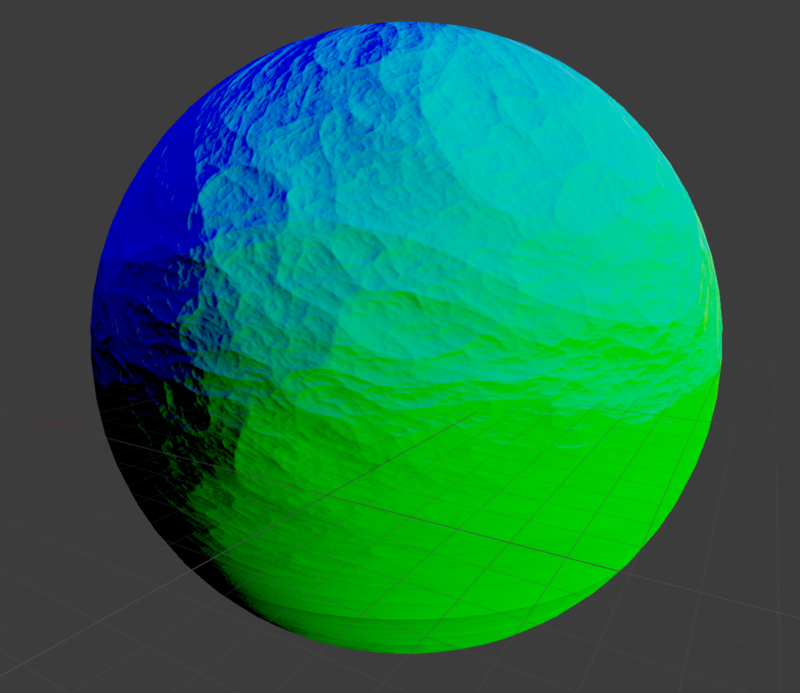 On top of that, we animated the surface of the orb by panning uv coordinates. Finally, the particles are driven by vector field created using Maya’s Fluid Simulator. A vortex and a turbulence component are added so that particles are moving in a more interesting way. This week with we went about brainstorming and implementing changes based on our playtest results. Since this was a moving experience, pacing became much trickier than originally anticipated. There was no deterministic way of resolving the issue and so we implemented a mechanism to adapt to the viewer. As the experience proceeds, the bird would pause as the viewer looks around and resume movement when he/she looks in the direction where story events were to occur. Since the experience was now no longer railroaded, the environment also needed to react to the viewer accordingly. 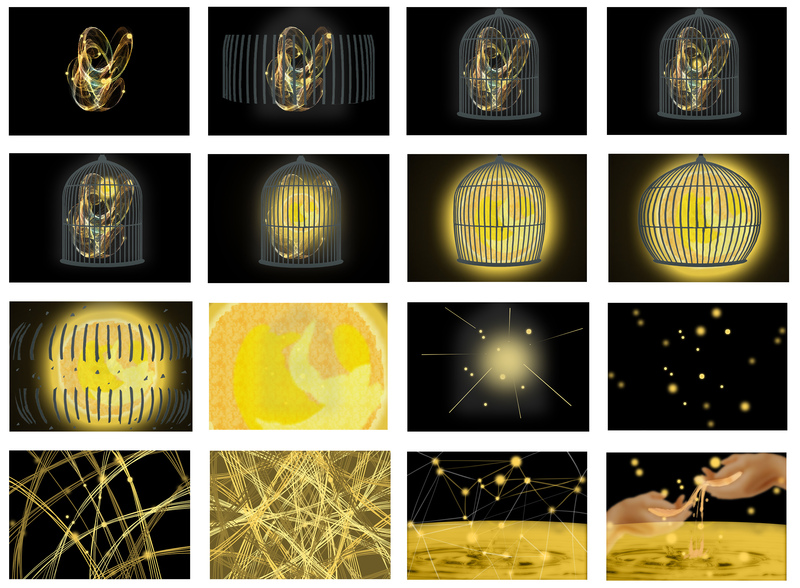 For example, the current glow implementation needed to change to glow until it caught the viewer’s attention. Similarly, sound could no longer be linear and had to be trigger based as well with a looping background score. At one stage, the bird moves in a circular path around a fountain. To execute this, the original idea was to fix the player’s forward orientation with that of the bird. However, we observed that no matter how smooth the rotation, this still caused an element of motion sickness. prompting us to rethink the bird’s path. This week we conducted our first group of playtests with a set of eight playtesters. Our overall agenda was to assess how viewers are responding to the world and the arc of the experience. Considering that the agenda was exploratory, we used the format of an interview to over that of a survey so that the session can adapt to the playtester. While everyone agrees the environment and sound is quite visually pleasing, the world is currently not hitting at any specific meaning. This means people aren’t really able to derive meaning from the world in any way. The specificity of some lines of dialog and the abstraction of others is confusing players. Turns out the phrasing of these lines and specific word choices are a lot more important than we thought since they are the only guiding sources in the experience. And finally there are certain parts where the implementation is simply lacking to assess what we need. For example, the spring is currently not being associated as the source of the voice at all making the dialog feel disembodied. Some of these we had expected while others we hadn’t and each problem will be iterated on in our prototype. At this stage in the experience, the team felt like we had a sufficient amount of clarity on the direction of the project to finalize and lock down on a production schedule. In producing cinematic VR experiences, particularly non interactive experiences, there is an interesting conflict between two production styles. On one hand there’s a game based iterative production style where development flows from one prototype to another to refine gameplay. On the other hand there’s the film production style which is much more focused and sequential to produce the beautiful imagery. Our production scheduled needed a combination of both of these styles. As we mentioned previously, we designed the experience as two parts which one is concrete and the other abstract. While Nikhil is working on the gameplay and production schedule, Luo is working on the environment layout and refinement of the world in Act 1, and at the same time Yang is working on the Act 2 morphing according to Catherine’s storyboard. In the mean time, Catherine is working on Act 2 soundtrack and Act 1 SFX. This week we looked at the prototype version of our world and tried to project how the world would look given the trajectory of development. Translation from concept art to implementation felt a certain sense of absence in the world. What appeared a big beautiful world in 2D images felt barren and incomplete in the headset. 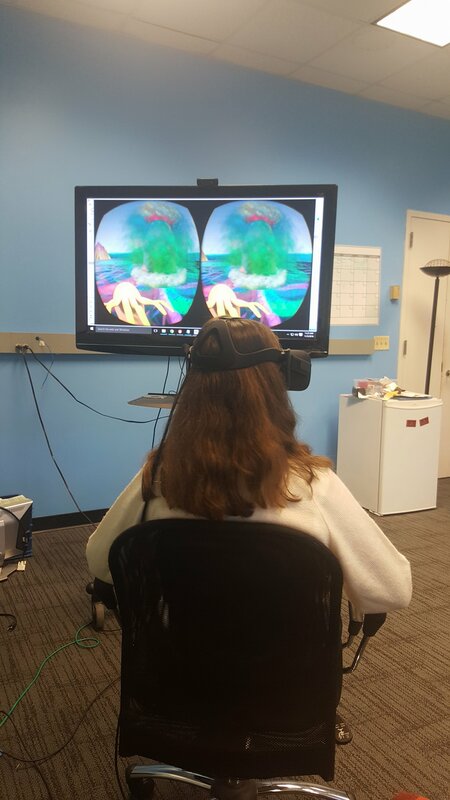 We adapted to VR by couching the entire sea in a massive waterfall creating a basin like feel. This made the world feel a lot more complete and fit nicely into the premise of a fantasy world. Additionally, the original current implementation was entirely based on vector field based particle systems. This didn’t scale very well performance wise and so we switched to a mesh based system with a material to simulate the feeling of the currents flowing. Week 5 triggered an avalanche of feedback as the concept and progress made thus far was presented to the faculty for evaluation. Generally speaking the idea was met with intrigue and interest with the general premise for the environment being appreciated. There were concerns about the design complexity and how integral they were to the experience. The feedback triggered a team conversation on what our priorities were and how we would dedicate resources. We came to the conclusion that our overarching agenda was to deliver a visually impressive experience and that the design would only serve as scaffolding. We also used the week to hone in on visual direction by developing more targeted pieces of concept art.